One of my hobbies on social media is to read other people's comments on trending issues. Whenever news sites like AJ+, Now This or Straits Times posts on Facebook, I would go to the comments section without fail. Just to see if there is a different perspective on an issue aside from mine, and how much does my view differ from others. As I write this, Donald Trump have just secured another victory in the Republican nominee race. Not surprisingly, news sites have already put on opinion pieces on his win. A majority of thm mocked the victory, expressing disbelief at yet another Trump victory. One of the comments even questioned the sanity of Trump's supporters: How can they be so ignorant to the fact that he will bring more harm than good? But like any other post, you have an equal amount of support expressed for him in the comments section. How liberals are destroying the country, how Trump is the only one with enough authenticity and authority, or how Trump has the best policies to make America "great" again. One thing that I have realised from my stalking of the comments section is that while we may talk about differences in our income, occupation, gender or religion; we are not giving enough focus on the one difference that I feel should matter most: the way we think. How we consume information and how we shape our worldview based on it. My guess is that the way we think is a differentiating factor in determining our stand on issues, and in this case, whether you'll support or oppose a figure like Trump. What I have noticed as I looked at the way Trump's supporters argued, is that they are very selective of the information that they use to support their stand. It's very similar to how global warming deniers and anti-vaccination groups, where they choose and pick the information that they believe in, while ignoring facts that does not agree with their worldview. Psychologists calls this a confirmation bias, a fallacious method that we usually employ in thinking. I admit that perhaps not all Trump's supporters use this line of argument, but from anecdotal experience, it sure seems like all of them are. For someone like Trump, this gets especially scary. Because he is a person who says things that people want to hear, there is a higher likelihood that you will find something that you like about him, especially if you're a hardline Republican supporter (or a Trump supporter). The interesting here, however, seems to be how most of his supporters do not see beyond the points that he make, ignoring disrepancies in his campaign. As a thought exercise, I wanted to know whether the profile of a Trump supporter may differ significantly from a non-Trump supporter, in terms of education specifically. The reason why is because I am assuming the way we think is shaped by the kind of education that we get. One is less likely to make a cognitive bias if we are aware of it, and one is more likely to be exposed to cognitive biases if one goes through tertiary education. And guess what? My assumption proved to be somewhat correct. Education level is indeed a factor in predicting whether you support Trump. (Washington Post: Donald Trump’s surge is all about less-educated Americans | FiveThirtyEight: The Key To The GOP Race: The Diploma Divide). To clarify, this is not to say that all of Trump's supporters are uneducated. But I would venture that there may indeed be a different thinking style between a Trump and a non-Trump supporter. Or as how I see it, an inequality in thinking. Correct me if I am wrong, but as far as critical thinking goes, I would suppose that someone who is aware of the possible thinking fallacies, ie confirmation bias, would make a better decision than someone who is not. By knowing the potential pitfalls of decision making, the person knows how to avoid it, thus making a more informed choice. This then leads to the final question: If there's a difference in the way we make decisions, then shouldn't those who can make better decisions be entrusted to a bigger say? A long time ago, back in 1994, Lee Kuan Yew pushed for this idea of "one man, two votes", where a segment of population gets two votes instead during election. According to him, people who are contributing more to the society (working adults) should have a bigger say in determining the government, because they have a higher stake in the society. In the UK, up until 1948, people were allowed to vote for more than once according to their educational levels. This is a highly controversial point, but the assumption here is that people who attain a certain degree of education will think in more logical way than those who do not; and by extension are in a better decision to make better decisions in issues such as climate change, human rights and health, for example. Therefore, their voice should carry more weight in society. Of course, this move also runs the risk of breeding elitism, where the society's interests are vested in a group of people, and the government pandering only to one segment of the population. It would also widen the gap of inequality, fueling the case of the rich getting richer. Also, there's also the question of determining the criteria. Do everyone who gets a degree automatically earn the right or must it come from affiliated universities? There is also a risk of sabotaging the system by those with vested interests. However, sticking to the current status quo is not any better as well, if we were to go back to the case of Trump. 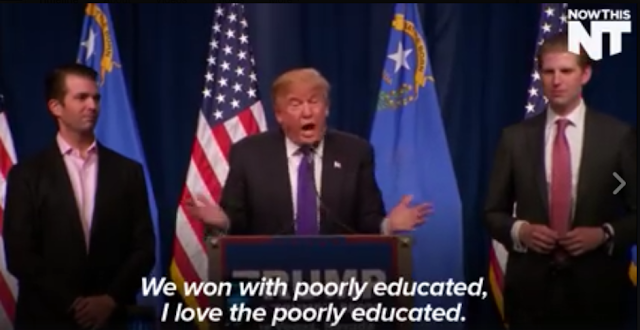 Indeed, in his Nevada victory speech, Trump is already saying that he loves the poorly educated. And they cheered for him! Perhaps the best way is to at least bridge the educational gap in our population and by extension, aspire to bring people to a minimal thinking ability. Standardise the minimum education level of the whole society, ensuring a common frame of reasoning. A suggestion, perhaps, could be to make logical fallacies a compulsory subject in education. In our evolving society where there is an overload of information, it is increasingly vital that students are taught how to think critically. 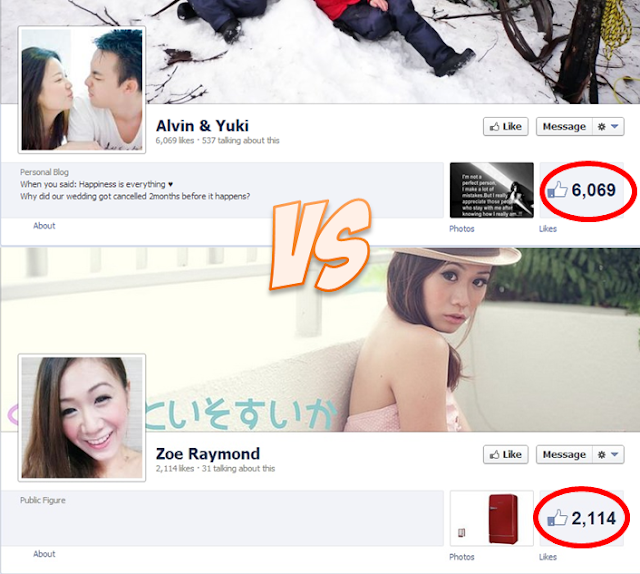 Perhaps it's time we add reasoning abilities into the list of inequalities we need to address?